Most issues that affect the switched network are encountered during the original implementation. Theoretically, after it is installed, a network will continue to operate without issues. However, that is only true in theory. Things change; cabling gets damaged, configurations change, and new devices are connected to the switch that require switch configuration changes. Ongoing maintenance is a fact of life. Switches operate at multiple layers of the Open Systems Interconnection (OSI) model. At Layer 1 of the OSI model, switches provide an interface to the physical media. At Layer 2 of the OSI model, they provide switching of frames based on MAC addresses. Therefore, switch problems generally are seen as Layer 1 and Layer 2 issues. Some Layer 3 issues could also result, regarding IP connectivity to the switch for management purposes. 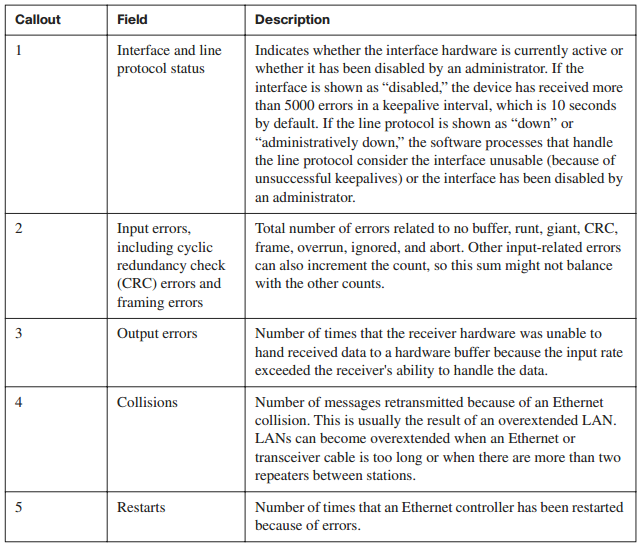 The following sections describe using a layered approach to identify common switched network issues. In an environment using Category 3 wiring, maintenance installs a new air conditioning system that introduces new electromagnetic interference (EMI) sources into the environment. In an environment using Category 5 wiring, cabling is run too close to an elevator motor. Poor cable management puts a strain on RJ-45 connectors, causing one or more wires to break. New applications change network traffic patterns. PC can cause an increase in collisions. Damaged wiring and EMI commonly show up as excessive collisions and noise. Changes in traffic patterns and the installation of a hub will show up as collisions and runt frames. These symptoms are best viewed using the show interface command, as shown in Example 2-13. Table 2-9 explains the highlighted fields in Example 2-13. Media-related issues can be reported as an access issue. (For example, the user might say, “I can’t access the network.”) Media issues should be isolated and resolved as indicated in the previous topic. Duplex-related issues result from a mismatch in duplex settings. Speed-related issues result from a mismatch in speed settings. Use the show interface command to verify the duplex settings. This topic describes methods of identifying and resolving common configuration issues. The watchword when it comes to configurations is better safe than sorry. You should always know what you have before you start. When you have a working configuration, keep a copy. For example, keep both a hard copy and an electronic copy—a text file on a PC and/or a copy stored on a TFTP server. When making changes, before saving the running configuration, verify that the changes accomplish what you wanted and do not cause unexpected issues. Changes made by an unauthorized person, whether malicious or not, can be disastrous. To ensure that you have secured the configuration, have both the console and VTY ports protected by a strong, complex password. Also, ensure that a strong, complex password has been enabled to enter privileged EXEC mode.